Fanny Howe. Leslie Scalapino. Martine Bellen. Anne Waldman. In the early 90’s, I paired Leslie Scalapino’s book Crowd and Not Evening or Light with Emily Dickinson’s poems for a graduate/under-grad course entitled Melancholia and American Literature, as examples of two experimental poets from the 19th and 20th centuries. We also read several novels and theoretical work by Kristeva, Freud and Klein. At the time I was also reading Lacan. When I open up Leslie’s book now, those swings and the waves—I feel a chill—and a paper falls out with some questions I was asking my class back then. Is she breaking the law, the customary laws of linearity in poetry? Is an opening being created here? A possibility? To “see” something, to defamiliarize it, the boundaries that depict it must change, loosen up, then when we see it, do we lose it again in its movement toward familiarity? Is she creating an opening out of the container of melancholia? How does she escape the violence of definition? I still love this book, the handwriting, photos, dashes, words. 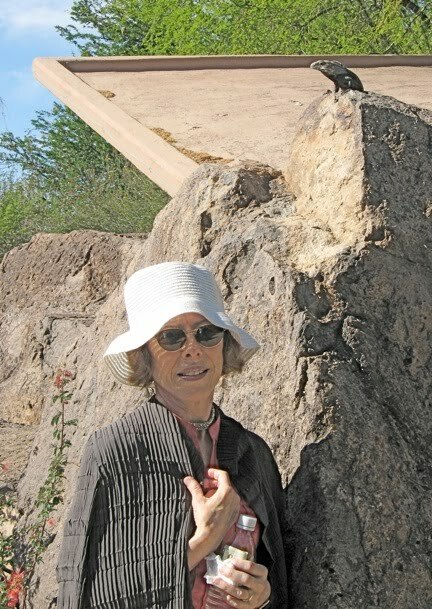 I was lucky to be living in Tucson in May of 2008 when Leslie read for POG, a poetry collective. I finally had the opportunity to spend time with her. You can link to the reading and see photos of her at http://www.gopog.org/ During that same visit, Laynie Browne, Tenney Nathanson, Charles Alexander and I performed with Leslie in her play: “As: All Occurrence in Structure, Unseen.” I remember we were supposed to all wear similar colors but for some reason we were diverse. It was a serious-nonsense upside-down love and death and humor and confusion, a law-breaker, redefining the familiar, and opening up the space between words. It was a lot of fun and a shame that the recording equipment broke down. I also spent an afternoon with Leslie at the Desert Museum. Lots of space between our sentences. Lots of quiet walking. I remember she was suffering from serious back pain, but that didn’t stop her from taking the entire walk around the grounds. Down below is a photo of Leslie wearing one of my hats. Even though she was in pain, she cracks a little smile because there is a lizard above her and she wanted to be in the photo with the lizard. Fanny Howe’s Saving History (Sun and Moon Press, 1993). Recently, I picked Fanny Howe’s novel, Saving History, off my shelf. I’d been meaning to read this book for years. Once I started it, I couldn’t put it down. It is wonderful, the narrative, the meandering poetic prose that fluidly moves from interior to exterior, from one point of view to another, dialogue erupting out of action that twisting and turning and always progressing. A mystical wandering woman, Felicity, with two children, one deathly ill—she wanders in and out of other people’s lives, often abused or sheltered by men who are confused or seeking their own salvation or destruction. The novel takes them across the country from Maine to San Diego and into Mexico where she is tempted to transport body parts in order to save her younger daughter’s life. The story is political and mystical. Characters are involved with communism, politics and criminal plots. There is a nightmarish tone. But then Felicity draws her little girls closer to her as she wonders about the meaning of life. Often she seems to make the wrong choices in terms of creating a stable home for herself and her children. Here there is no way out of suffering, except for the moments of love, the love between mother and child, brother and brother, sometimes man and woman, and, of course, the love for the poetic phrase and Howe’s vision of the amazing ever changing ever screwed up ever beautiful world. At night after reading Howe, I dreamed about thin ice, dark coats, ice skating, and the final reunion between the main character and her family. Martine Bellen. 2X Squared. BlazeVox 2010. Bellen merges everything she reads and hears into this story, making us remember oh so many other writers and friends. Googling and goggling and myspacing, the first person narrator imagines, theorizes, remembers, and analyzes every myth or story about twins as she tries to find her sister. Her mother was on fertility drugs. The scientific language of doubling. The story of the Acomo twins. She’s a dreamy thinking girl-woman on a dreamy journey, telling her story and letting us hear and watch her think. It’s a roller coaster read and if you like roller coasters, you’ll like this book. The following review was published in the Kore Press Newsletter. May/June 2010. In Matriot Acts (Chax Press, letterpress chapbook, 2010), Anne Waldman goes to war with “The Patriot Act”. In this performance poetry text, she takes to task “Patriot”, and all of its relatives and ancestors, examining and then crossing them off. Cross off Patriarch, Patriachal, Paternalism, Pater Familias. Cross off Wall Street (“the belly of the beast”). Because the destructive “Pater” energy in the universe is out of whack, the opposition must come into play. When the freedom of speech, privacy and movement are chiseled away, and the U.S. citizens sit and watch tv and play with their computers, then the loud-mouth poets need to speak out, chant, call upon the energies of reversal, call for a “Matriot Act”. And so this Feminafesto. Anne calls forth the Matriachal, Matrilineal, Matrotism. Yes to restore balance, the opposition is needed, and here it is the female principle, the “woman-mind”. The poets must band together like the mothers of the disappeared—wake up the women, change the world—mothers and sorceresses. Waldman chants and screams and begs to “Invoke the sweep of history.” Words that start with “pa” are implicated all over these pages. Then she turns to the “ma”. “Will I trust my activist eyes” “to dance out of the cage”? In between the acts, two old poet-god/esses that have been in hibernation for a while start to talk, an “Old beard” and an “Old she-bear”. Where did we go wrong? Where is the she-bear to go now? “Get arrested and listed as a beard?” And the chorus pushes forward: “Matriot, run riot!” And then the poem-play-words begin to dance, invoking the great protectress Kali (“Kali is also an alphabet . . . mother of language”). To right the universe, Kali begins her shakti dance on the body of Shiva, the great destroyer. “Each letter, a form of energy, a twinge of energy, a torque of energy.” To ban drones, predators and handguns and stop the violence, stop the war. The Buddha came when compassion was needed. The great mother Kali comes when she is needed, but first we must call for her. Waldman’s play-poem is a grand calling forth of the female poetic principle. To stop the war. Stop it now. Stop.